In response to the On Demand release of David Mackenzie’s Perfect Sense, which enjoyed screenings at the 2011 Philadelphia Film Festival, Without A Screen curates a hypothetical series of sense-related cinema. Films of the Proof By Contradiction subset explore humanity through its negation, where various human biological functions are crippled to produce platforms of existential inquiry. In the case of Perfect Sense it is the senses themselves slain by a mysterious and indiscriminant epidemic, which sweeps the globe in stages. The consequences and adaptations, which stem from that loss, are expressed in intimate scale between a Chef named Michael (Ewan McGregor) and a scientist named Susan (Eva Green). Their lives, together and apart, are macrocosmic prisms for a global event. Our physical capacities (senses) are inextricably entwined with our cognitive and emotional being (identity). Proof By Contradiction films posit this mind-body contiguity by displacing it. 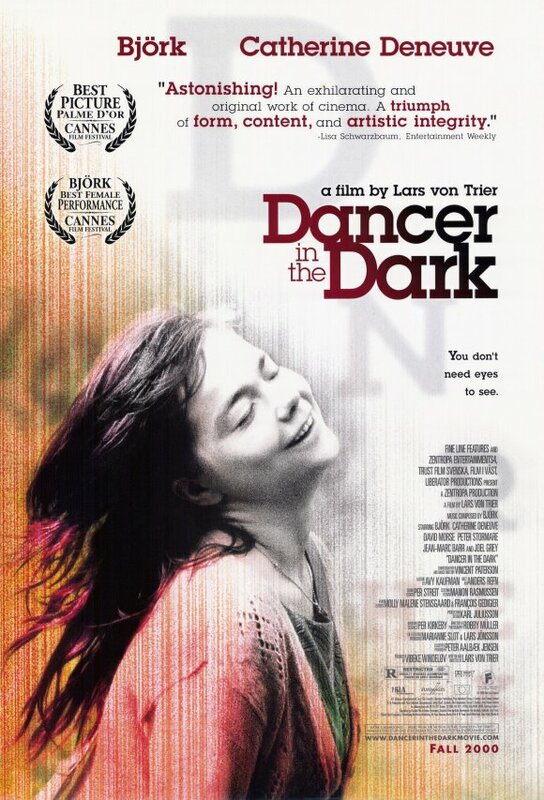 Dancer In The Dark (2000) – Selma (Bjork) works herself to the bone, saving money to pay for her son Gene’s eye operation. She keeps this fact secret from Gene, for fear of escalating his condition through worry. In the doldrums of work and a marginal existence, her imagination sets fly into elaborate musical numbers that incorporate the elements and sounds of her environment; ie. the industrial machines at the plant, the nearby trains. Selma too is going blind, and is nearly so. Her ability to work, the joy she derives from seeing the world, and her elation about participating in a local musical production constantly decline. A tragic line of causality leads her into the direst circumstances, where her hard-earned money and therefore her son’s operation are in jeopardy. Lars Von Trier’s film is brilliantly manipulative on an emotional front, yet its unvarnished expression and life-imbued performances render Dancer In The Dark earnest and authentic. The dramatic use of the “musical film” form is all the more rending because of these qualities as well. 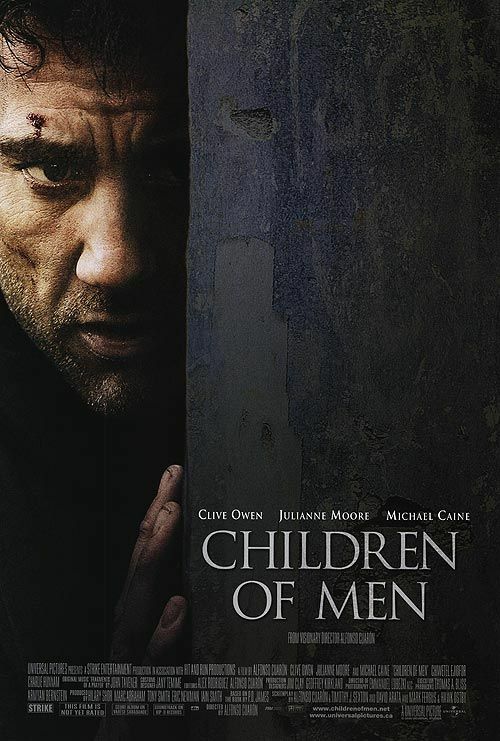 Children of Men (2006) – Women have stopped conceiving. A child hasn’t been born in almost 20 years, without any explanation. Societies and values crumble in reaction to the seeming inevitability of human extinction, raging against their powerlessness to stop it. A band of rebels aim to get a woman of unique importance to the coast as they encounter conditions reminiscent of the holocaust. Director Alfonso Cuaron creates a desperate world of remarkable tactility, wherein the tactility is its greatest sensationalism. Cuaron’s spectacle has gravity and he explores the experience of a world rendered infertile on the scale of individuals. Love and Honor (Bushi no Ichibun, 2006) – Shinnojo is a young samurai with dreams of opening a kendo school for young boys. He lives peacefully with his wife in a modest but beautiful home. To his disappointment he is assigned as a food taster for his feudal lord. During a routine tasting, he is struck with fever and goes blind. Investigations reveal that an out of season shell-fish was the cause. Relegated to his home, Shinnojo undergoes an existential crisis, where his capacities as a samurai and a caretaker are challenged. He rises to the occasion however, when his wife is marred by a high-ranking samurai’s amorality. Director Yoji Yamada explores the drama as a subject and blindness as an object. Within a society of such fastidiousness, ritual, and formal precision, it is all the more compelling to observe someone navigate an incapacity to participate in that behavior. His film has a small scale, and is all the better for its lack of irony. With Love And Honor as example, Yamada is a master of negotiating the line between sensitivity and sentimentality. 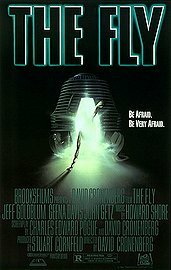 The Fly (1986) – A reclusive scientific genius named Seth Brundle (Jeff Golblum at his absolute best) is troubleshooting a short-range teleportation device. When a fly is trapped in the machine during a test, the machine combines its DNA with Brundle’s, and he finds himself slowly mutating into a human-fly hybrid. Veronica Quaife, the journalist documenting Brundle’s experiments and falling in love in the process, is powerless to stop the degradation. Cronenberg’s visionary work devastates as it dissolves a man’s humanity piece by piece, and yet invigorates the human spirit as Brundle feverishly works to undo the mistake and teach his machine the distinctness of forms. 28 Days Later (2003) – The Rage Virus, an infection of the blood which limits the human emotional spectrum to unadulterated anger, spreads across England and presumably the world. Danny Boyle drops us into the middle of the melee, as confused and fearful as Jim (Cillian Murphy), who wakes from a coma to a desolate and littered London. He joins a small band of survivors that do whatever they can to stay alive. Along the way, Boyle expresses many attitudes towards this new paradigm of living, and the seemingly hopeless prospects for a future. The removal of emotions renders humans into a loosed rabid animal, and 28 Days Later wonders to what degree our emotional agency determines our personhood. Boyle shows rather than tells, with unrefined grit. Womb (2010) – Rebecca (Eva Green) and Thomas (Matt Smith) are childhood best friends, and also each other’s first love. They are separated when she is relocated to Japan, but returns to the seaside town of their youthful days after college. Thomas still lives there, and they begin to reconnect, remembering the bond of their childhood. Tragedy separates them once more, but they are “reunited” when Rebecca makes a controversial decision to give Thomas a second chance at life. Womb is achingly beautiful, and cool to the touch. Its mood is rarefied, and its time is unfixable. Never Let Me Go (2010) – As children, Ruth, Kathy and Tommy, attend an English boarding school, and director Mark Romanek entreats us to the devastating social and emotional turmoil inherent in such an environment. Now come of age, and placed in halfway houses associated to the school, the trio find themselves coming to terms with complexities of their reality and their shared histories. With time advancing on the guarded purposes of their existence, they prepare themselves for a haunting prospect. Like Womb, the future feels distinctly like the present (if not timeless), which makes Never Let Me Go all the more effective on an emotional appeal. Cages (2006) – This brooding Belgian film revolves around Eve, a devoted paramedic who is injured in vicious Ambulance accident. Though doctors protest that her vocal chords are unharmed, afterward Eve suffers from onset mutism, plagued by flashbacks of the accident. Her longstanding relationship with bar owner Damien suffers greatly as his energy seems wasted in motivating her healing process. A year later, Eve can barely stammer a few syllables. Tensions mount from Eve’s reclusion (in her room and within herself), and forces Damien into another woman’s arms. Writer/director Olivier Masser-Depasse takes this story to visceral and, eventually, nearly-allegorical heights as Eve finally confronts this turn of events in her relationship and in her body. She is forced to draw meaning from her condition, and the audience gains a dynamic scope of what the title infers.